A major annual scheme to replenish Lincolnshire beaches will get underway this week, helping reduce flood risk to thousands of homes and businesses along the coast. 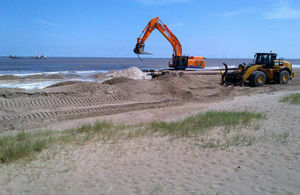 The Environment Agency’s flagship Lincshore scheme sees sand dredged from the seabed and pumped onto the beach, replacing levels lost to the sea during the winter. This reduces the risk of waves reaching and overtopping the main sea defences, protecting them from damage and erosion. This year, the £5m project will begin on Friday, 6 May at Boygrift. Over the next 6 weeks, beaches at Sutton on Sea, Trusthorpe, Mablethorpe, Ingoldmells, Trunch Lane, Walla Bank, Chapel Six Marshes and Huttoft will be replenished. The sandy foreshore of our beaches takes the brunt of the waves’ energy, which would otherwise impact on coastal defences like our sea walls. But during the winter, storms can erode the sand from these beaches. Replacing the sand helps extend the life of our sea defences, which in turn reduce flood risk to more than 30,000 homes and businesses, 19,000 static caravans and 35,000 hectares of land. This also provides an amenity benefit to tourism on our coast, as otherwise there would be very little sand on our beaches. We time our works to minimise disruption to local communities and visitors, but unfortunately some inconvenience is unavoidable as we will need to close off sections of beach while we work on them to keep people safe. Lincshore maintains a vital part of Lincolnshire’s coastal flood defences and we hope people understand why we need to carry out this work at this time of year. This year, around 350,000 cubic metres of sand will be dredged from designated off-shore areas and replaced onto 20km of beach. The dredger used will be the HAM316, which will carry about 10,000 tonnes of sand at a time. Additionally, the equipment used on the beach has the lowest carbon footprint of its class. Lincshore first began in 1994 and covers beaches between Skegness and Mablethorpe. The Environment Agency is currently reviewing how coastal flood risk will continue to be managed in the future and will be seeking the views of local communities, businesses and partners to help shape this. While Lincshore helps maintain an excellent standard of protection from flooding, those living and working in coastal communities should take steps to ensure they know what to do in an emergency – such as knowing your risk, making a plan, and signing up for our free flood warnings. To find out more, call 0345 988 1188 or visit our page about flooding.